MEXICO CITY/TAPACHULA, Jan 24 2019 (IPS) - A few months ago, Candelario de JesúsChiquillo Cruz reached Mexico’s southern border and ran into a fence reinforced with barbed wire, while a barrier of police officers sprayed him with gas. Today, he is walking freely over the bridge that crosses the Suchiate River, a natural border with Guatemala. Chiquillo, a 50-year-old from El Salvador, does not hide his pleasure at the welcome he has received in his new attempt to enter Mexico. “It’s an opportunity that I have sought for a long time,” he told IPS on Jan. 22, as he showed the document with the number 0000004155128 issued by the Mexican government’s National Migration Institute (INM) in Tapachula, a city in the southern state of Chiapas, on the border with Guatemala. This document will be exchanged in a few days for a “humanitarian visitor card” that will allow him to live and work in Mexico for a year. “I congratulate Mexico for the position it has taken, allowing us to legally enter the country without being persecuted as migrants. What we want is an opportunity to work,” he says. Mexico’s immigration policy has taken a 180-degree turn under the administration of leftist President Andrés Manuel López Obrador, who took office on Dec. 1. 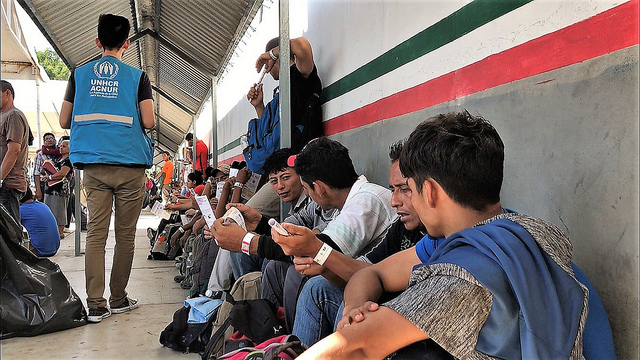 On Jan. 17, the government opened the border to thousands of migrants coming in a caravan from San Pedro Sula, Honduras, fleeing violence, poverty and repression, and announced that it would issue humanitarian visas for the Central American migrants. It also announced a new labour plan that incorporates Central American migrants into development projects in the southeast of the country. The approach runs counter to Mexico’s policy in recent years, which focused on stiffening border security and militarisingthe southern border to keep migrants out. With the Southern Border Plan of Lopez Obrador’s predecessor, the conservative Enrique Peña Nieto, thousands of people were deported and dozens died after resorting to more hazardous routes in the attempt to evade police controls. The arrival of the new government coincided with an unprecedented immigration crisis that erupted in October. Since then, more than 15,000 Central Americans began a series of massive caravans to reach the United States, crossing almost 3,900 kilometers of Mexican territory on their journey. It also aims, he said, to give a boost to the joint development of the south of this country and the so-called Central American Northern Triangle, made up of Honduras, El Salvador and Guatemala. On Jan. 18, when the first visitor cards for humanitarian reasons were issued, Guillén explained that the plan has two components: mobility, with the authorisation of the humanitarian visas, and the promotion of development in the region. That means extending work permits to people from Honduras and El Salvador, like the ones Mexico already granted to migrants from Belize and Guatemala. Representatives of the United Nations Refugee Agency (UNHCR) and the International Organisation for Migration(IOM) are accompanying the delivery of the cards in the initial stage. “The IOM is working in close coordination with government institutions, in particular the INM, to improve the conditions of migrants entering the country,” IOM representative in Mexico Christopher Gascón told IPS. But it is not a simple problem. 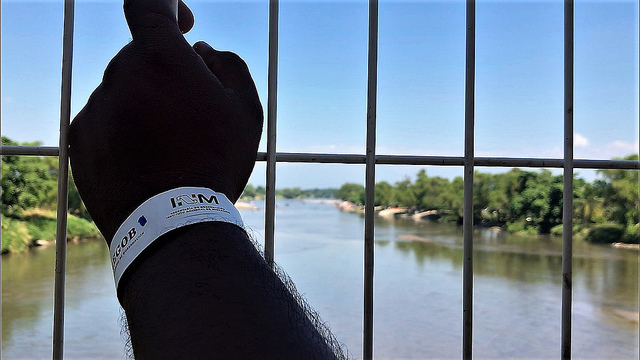 According to data from the Mexican government’s Refugee Assistance Commission (Comar), asylum applications from Central Americans in Mexico climbed from 3,424 in 2015 to 26,566 in 2018. And now, in the first five days since the open door policy was established, 7,805 migrants – 6,431 adults and 1,374 children and adolescents – have applied for Mexican protection. 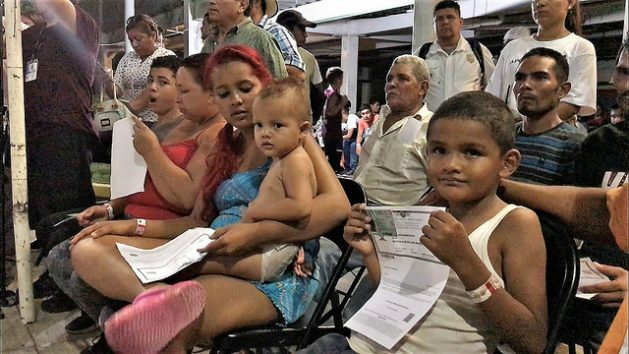 Thousands of migrants line up to apply for the card, which is for one year but can be renewed for three more, after which they have a chance of being granted a permanent residence permit in Mexico. The vast majority (just over 6,000) come from Honduras but there are also applicants from El Salvador, Guatemala, Nicaragua, and a few from Haiti, Brazil and Cuba. In December, while presenting the new National Migration Plan, in force until 2024, Secretary of the Interior Olga Sánchez Cordero stressed that Mexico is the first country to adjust its migration policies to the new Global Compact for Safe, Orderly and Regular Migration, signed at the United Nations headquarters in New York on Dec. 19, after being agreed at a conference in Marrakech eight days earlier. However, the signals sent by the Mexican government are ambiguous with regard to some controversial points. And for some critics, the new reception policy actually represents an acceptance of turning Mexico into a “safe third country”, curbing migration to the United States – a demand reiterated by U.S. President Donald Trump. In addition, the second component of the programme, the work aspect, is linked to a U.S. investment project aimed at boosting the economic development of southern Mexico and the countries of the Northern Triangle. Foreign Secretary Marcelo Ebrard Casaubón announced on Dec. 19 that the U.S. government will invest 5.8 billion dollars for the economic development of that Central American region over the next five years, plus another 4.8 billion dollars in southeastern Mexico. The Mexican government presents this investment as a kind of Marshall Plan (which helped rebuild Europe in the post-WWII period). But skeptics see it as a new stab at a failed programme: the Plan Puebla-Panama that was attempted by the right-wing government of Vicente Fox (2000-2006) and that would create a controversial free trade zone with the construction of tourist towns in areas mainly populated by indigenous people, who have not been consulted. In addition, the main doubt about the investment plan lies in the level of commitment of the Central American governments to the development aimed at curbing migration. This is compounded by mistrust regarding the way the Mexican government will use the data that it is gathering from the migrants taking part in the programme, because in order to receive a humanitarian visitor’s card, they are asked for an identity document, a photograph and their full names, age, place of residence, fingerprints and an eye scan. This policy in theory should be a positive development, especially considering the level of vulnerability of migrants in Mexico to criminal groups like gangs and cartels. For now, the López Obrador administration has decided to implement a strategy to convince Central American migrants to take advantage of the humanitarian visa programme. For those who continue northwards with the caravan – some 2,000 who did not accept the proposal – special vigilance has been assigned to prevent road accidents and to provide them with humanitarian aid. So far, no migrants have been detained or deported. At the southern border, some of the Central Americans lining up for their humanitarian visas told IPS that they would try to settle in Mexico; others said they would use the safe-conduct to try to reach the United States, because now they would be able to follow that dream without the threat of being persecuted in the long, hazardous journey through this country. With reporting by Ángeles Mariscal in Tapachula and other towns in the state of Chiapas.